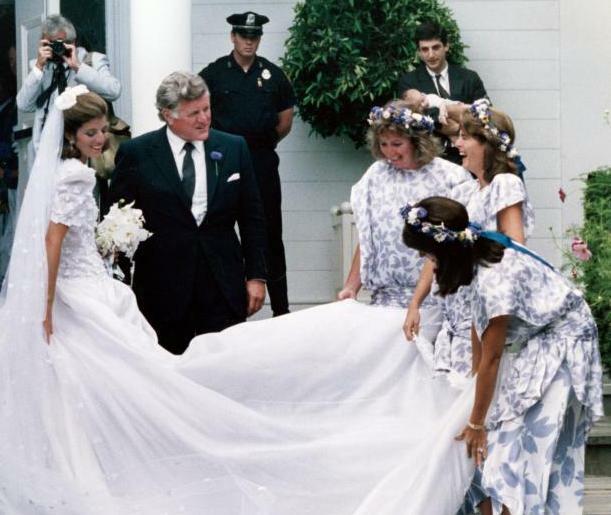 This post is about two Kennedy weddings … the first wedding is Caroline Kennedy to Edwin Schlossberg and ten years later the second wedding is John F. Kennedy, Jr. to Carolyn Bessette. But, before we start, let’s briefly discuss the immediate family of John F. Kennedy and Jacqueline “Jackie” Bouvier Kennedy (later Onassis). Many readers will remember the children of President John F. Kennedy and his wife Jacqueline from when they lived in the White House. At the time of their father’s inauguration in January 1961 the children were very young and tragically, less than three years later President Kennedy was assassinated in November 1963. 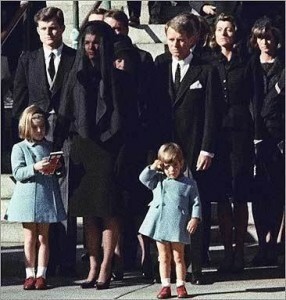 (I have a very vivid image of young “John-John” saluting his father’s casket). Sadly, John-John would celebrate his third birthday on the day of his father’s funeral and Caroline would turn six years old a few days later. After leaving the White House and Washington D.C., Jackie moved her two children to New York City to raise them away from the glare of the public and the press. Then five years later, with the assassination of Robert Kennedy in 1968 and Jackie’s subsequent marriage to Aristotle Onassis later that same year, the family would lead an even more closed life. As the years passed, Caroline and John grew into well-behaved and responsible adults, graduating school and moving onto careers. Sadly, Jackie lived to see only one of her children married. Caroline wed Edwin Schlossberg in 1986. The couple had three children; Rose born in 1988, Tatiana in 1990 and John in 1993. In late 1993, Jackie was diagnosed with non-Hodgkin lymphoma and went through chemotherapy but the cancer spread to other parts of her body and she died on May 18, 1994. 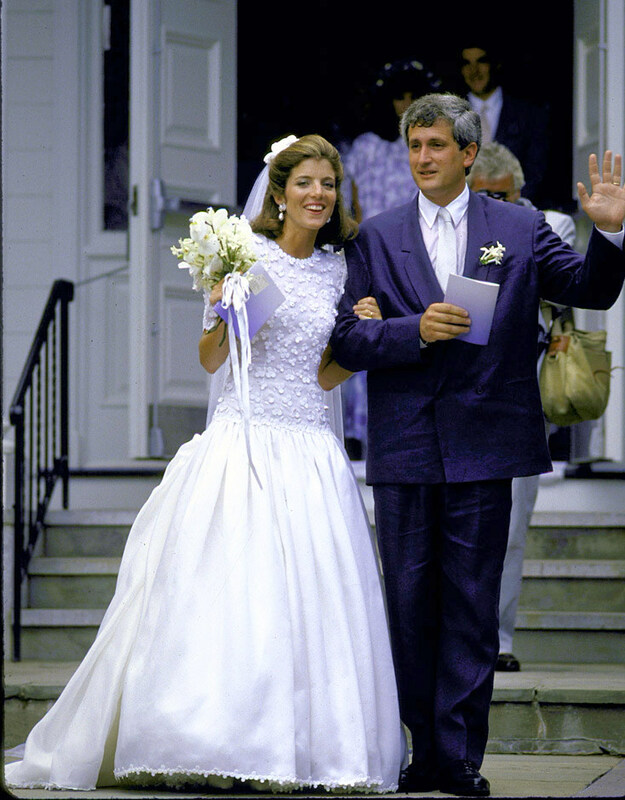 Two years later, John Jr. married Carolyn Bessette in 1996. Unfortunately, tragedy stuck the family again on July 16, 1999 when John Jr., Carolyn and her sister Laurel died in a plane crash. Today, the last surviving member of the immediate family of President Kennedy is Caroline Kennedy who was most recently appointed as the ambassador to Japan in July 2013 by President Obama. Caroline Kennedy and Edwin Schlossberg met in 1981 when both were working at the Metropolitan Museum of Art in New York City, New York. Caroline had a job in the Film and Television Department and Ed was working as an exhibit designer. 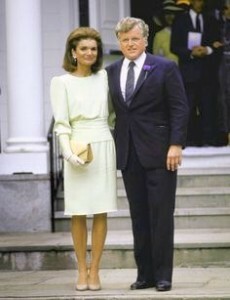 The couple dated for several years and became engaged in March 1986 with a wedding set a few months later with most of the planning to be done by Jackie Kennedy Onassis, the mother of the bride. The couple was married at Our Lady of Victory Catholic Church in Centerville, Massachusetts. on July 19, 1986. (which was also the groom’s 41st birthday) Many of the details of the wedding were keep secret in order to protect the privacy of the bridal couple. 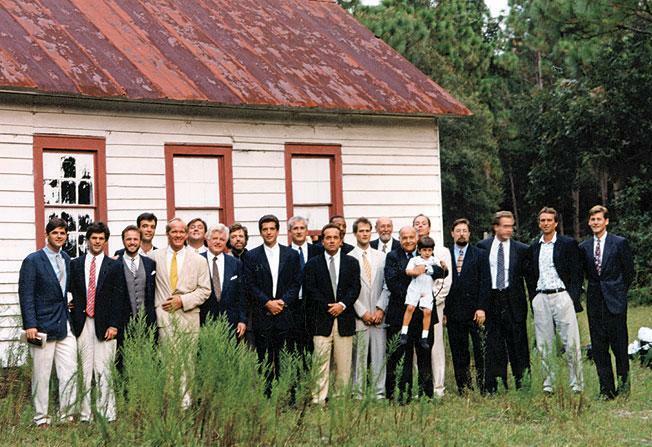 It is known that there were 400 guests invited to the ceremony and the reception which followed at the Kennedy compound in Hyannis Port located six miles away from the church. In addition to the numerous Kennedy family members and Schlossberg family there were several former aides of the Kennedy presidential administration; such as Arthur Schlesinger, Theodore Sorensen, Dave Powers and John Kenneth Galbraith. Caroline collaborated with Carolina Herrera to design her wedding dress. The white silk organza dress featured a round neck, short sleeves, a full skirt flowing into a twenty-five foot train and a long bodice covered with embroidered white shamrocks, which were the bride’s sentimental tribute to her father’s Irish ancestry. On her head the bride wore a large bow with a long tulle veil attached, she wore carried a small bouquet of white phaleonopsis orchids and she “borrowed” diamond and pearl earring which had original been a gift from her father to her mother. The groom wore a Willi Smith navy blue linen suit, a silver tie and a boutonniere of stephanotis. The matron of honor and seven bridesmaids wore white and lavender floral print dress with wreaths cornflower bouquets and more cornflowers in their hair and the two flower girls wore white organdy pinafore dresses with pale blue sashes, cornflowers were President Kennedy’s favorite flowers. The best man and ten ushers wore blue linen blazers, white linen trousers, gray linen ties and cornflower boutonnieres. The mother of the bride looked lovely wearing a pale green crepe dress with long sleeves and a narrow skirt designed by Herrera and long white gloves. For the wedding ceremony, the inside of the church was decorated simply with several potted bay trees behind the altar and around the church, as well as floral arrangements of delphinium, white lilies, cornflowers and Queen Anne’s lace. Across the altar was a garland of oak leaves and small bunches of wild roses and honeysuckle were tied on the pews. After the service, Caroline and Ed exited the church, briefly posed for photographs and then left for the reception in a silver limousine. 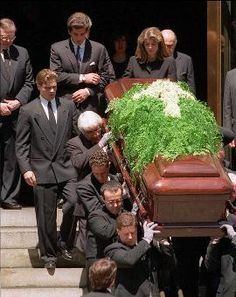 John Jr. blew his sister a kiss from the steps of the church and standing nearby Jackie held back tears as she clung onto the arm of Ted Kennedy. The wedding reception was held at the oceanfront home of the bride’s 95 year old grandmother in Hyannis Port. Under a large white tent decorated with blue pennants the wedding dinner menu included cold pea soup with mint, vegetable vinaigrette, roast chicken with rice, beef sirloin. The wedding cake was a four-tiered yellow cake with a chocolate filling and white icing which was served with a vanilla, chocolate and strawberry ice cream. At the reception there were several toasts but perhaps the most poignant moment was when John Jr. raised is glass and said, “It’s been the three of us for so long … and now there is a fourth” and then he warmly welcomed Ed to the family. To end the evening there was a wonderful fireworks display. Later Caroline and Ed left for their honeymoon in Hawaii and Japan. 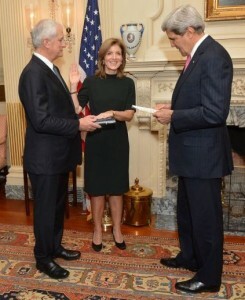 John F. Kennedy and Carolyn Bessette first met in 1992. After they began dating in 1994, the good looking couple was photographed constantly and every detail of their relationship was reported in the press while the couple tried to live their lives quietly in the Tribeca loft that they had moved into in the summer of 1995. By this time, John had left his job as a prosecutor in the Manhattan district attorney’s office to begin a career as the co-owner and editor of “George” magazine. John’s goal for the magazine, which would focus on politics, was to present topics in an entertaining way which would create public interest and subsequent involvement in the political process. At the time that Carolyn met John, she had been working for Calvin Klein but she later left her position with the company shortly after their engagement. 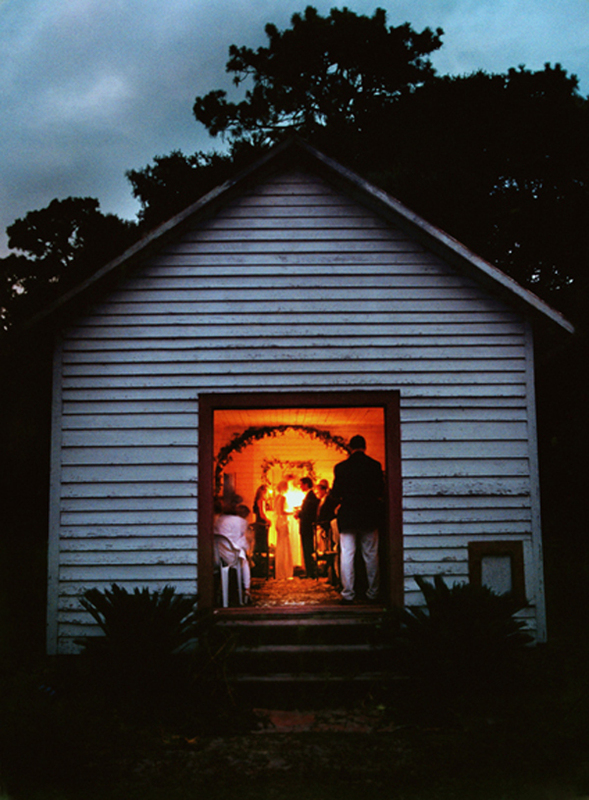 John managed to keep his wedding to Carolyn a complete secret from the intrusive press by marrying on the exclusive Cumberland Island off the coast of Georgia on September 21, 1996. The ceremony took place in the evening at the tiny wooden structure known as the Brack Chapel of the First African Baptist Church attended by only 40 guests who included the immediate families of the bridal couple and a few close friends, a reception immediately followed the wedding ceremony at the Greyfield Inn also located on Cumberland Island. The wedding officiant was Reverend Charles O’Byrne who had traveled from the St. Ignatius Loyola Catholic Church in Manhattan to perform the ceremony. Since the service took place in the evening and because the small church had no electricity, the inside was light by candles and kerosene lamps. A small wooden stand served as the altar and it was decorated with greenery, the only other decoration was a cross made from two pieces of wood tied together with rope. The ceremony was very short with several members of the bridal couple’s families giving scripture readings, also “Amazing Grace” and “Will the Circle Be Unbroken” hymns were performed by gospel singer David Davis. Shown on the right is the famous photo taken by Denis Reggie of the newlyweds leaving the church, John is gallantly kissing Carolyn’s hand as she beams with joy! The beautiful bride worked with the relatively new designer, Narcisco Rodriquez, in creating a “pearl white” silk crepe biased-cut floor-length gown which she wore with a tulle silk veil and long silk gloves, she wore beaded sating Manolo Blahnik sandals. Carolyn wore her hair in a simple bun at the nape of her neck and attached a tulle silk veil with a “borrowed” clip that once belonged to the groom’s deceased mother, Jackie Kennedy Onassis. Carolyn carried a lily of the valley bouquet. The handsome groom wore a Gordon Henderson dark blue wool single-breasted suit with a white pique vest and a pale blue tie. Much like his sister did 10 years earlier; the groom honored his father, President John F. Kennedy, by wearing his wristwatch. 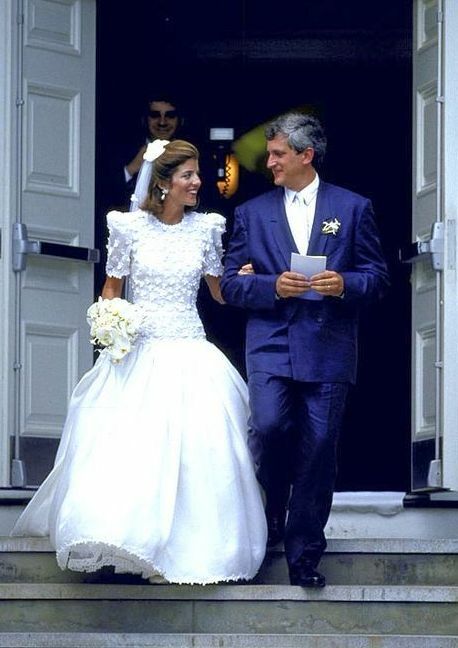 Anthony Radziwill, the groom’s cousin, was the best man and Caroline Kennedy, the groom’s sister, was the matron of honor and she wore a navy blue crepe silk gown designed by Narcisco Rodriquez. Jack Schlossberg, the groom’s nephew, was the ring bearer and Rose and Tatiana Schlossberg, the groom’s nieces, were flower girls and they wore tea-length white linen dresses. After the wedding ceremony, the bridal couple and their guests went to Greyfield Inn for a reception. The dinner menu featured shrimp, artichokes and grill swordfish. The wedding cake was a three tiered whit cake with vanilla butter cream frosting decorated with flowers. They couple later honeymooned in Turkey and had a ten day cruise on the Aegean Sea aboard the “Althea”. In the years following the wedding, John and Carolyn were constantly scrutinized in the press and frequently photographed as a glamourous couple attending functions in both New York City and sometimes Washington D.C. The fashionable Carolyn has a distinct classic minimalist style and she was often compared to her mother-in-law, Jackie Kennedy Onassis, who she had unfortunately never met before the former First Lady’s death in 1994. The photo below shows the couple in May 1999. Sadly on July 16, 1999 John, Carolyn and her sister Lauren died in a plane crash over the Atlantic Ocean while on route to Martha’s Vineyard. John had been the pilot of the small plane and it was later determined that the probable cause of the tragic accident was “pilot’s failure to maintain control of the airplane during a descent over water at night most likely the result of spatial disorientation”. The bodies were eventually recovered a few days later and on July 22 a memorial service took place aboard a Naval ship, USS Briscoe, and their ashes were scattered into the waters off the coast of Martha’s Vineyard. 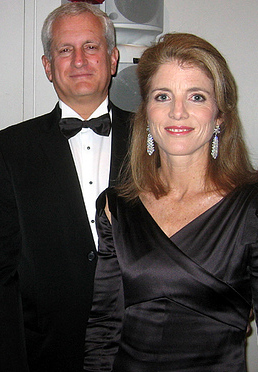 In the end, Caroline Kennedy Schlossberg is the only living member of President John Kennedy immediate family, the last link to the fabled modern day Camelot. 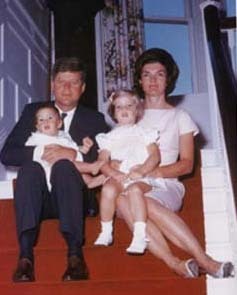 If you are interested in more detailed information on the wedding of John Kennedy and Jaqueline Bouvier, please click on the link. Two other posts of interest are: Jackie Kennedy – her White House Dresses and the John F. Kennedy Presidential Library and Museum. 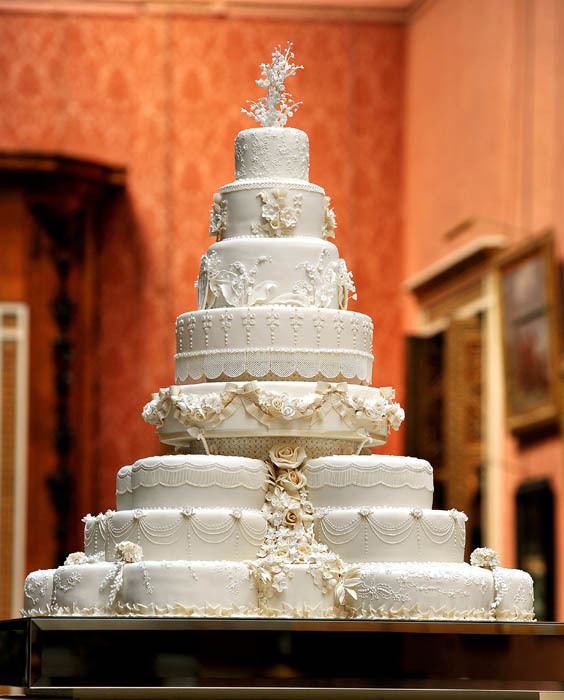 In this post, I will start by discussing several of the British Royal Wedding Cakes made throughout the years starting once again with Queen Victoria’s wedding to the wedding of Prince William and Catherine Middleton. 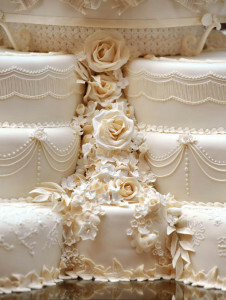 Then, in closing I will discuss the history of wedding cakes including the meanings the various traditions and customs. The wedding of Queen Victoria and Prince Albert took place in the Chapel Royal at St. James Palace on February 10, 1840. 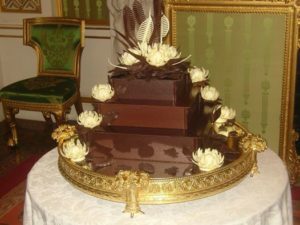 Afterwards, there was a wedding breakfast at Buckingham Palace were several cakes set out at the wedding breakfast, the main cake was a single layer about three yards in circumference and fourteen inches in height, it was noted to weigh approximately 300 pounds. The cake was covered in white icing and decorated with several figurines and other floral embellishments. 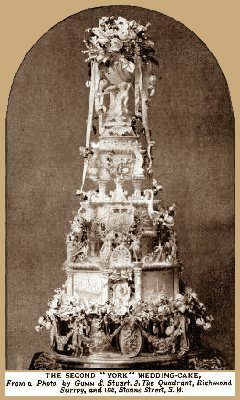 The cake top was almost a foot in height and featured a Britannia figurine and another figurine representing Queen Victoria on the right with a pair of turtle doves at her feet, while on the left was a figurine representing Prince Albert with a dog at his feet. A cupid figurine appears to be writing the date of marriage into a book and there a several additional cupids bearing the emblems of the United Kingdom. A photo of the cake is shown below. Prince Edward (later King Edward VII) and Princess Alexandra were married at St. George Chapel in Windsor Castle on March 10, 1863. A wedding breakfast for five hundred guests was held afterwards to honor the bridal couple. Like his mother before him, several wedding cakes were made for the reception with the main wedding cake shown in the photo below. The cake was described as follows: “it was a three-tiered cake with white icing, at the base were rose, thistle and shamrock festoons intertwined with with the British and Denmark coat of arms. 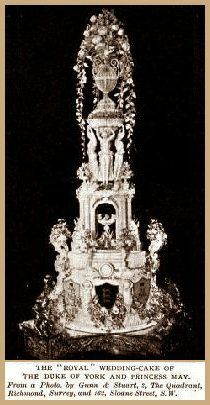 On the tiers were reflectors and figures of cupids with harps and near the top of the cake were two sating flags painted with the images of the Prince and Princess. At the very top were a Prince coronet with three ostrich feathers”, the symbol of the Prince of Wales. Prince George (later King George V) and Princess May (later Queen Mary) were married at the Chapel Royal in St. James Palace on July 6, 1893, followed by a wedding breakfast at Buckingham Palace. The main wedding cake measured almost seven feet high and it took over five weeks to make with almost forty separate pieces of plaster used to create the figure molds; it is shown on the photo on the left. The photo on the right shows the “second cake” which was smaller, measured four and a half feet tall and weighed almost 225 pounds. The cake is decorated with symbols reflecting Prince George’s naval career. Princess Elizabeth (later Queen Elizabeth II) and Lieutenant Phillip Mountbatten (later the Duke of Edinburgh) were married on November 20, 1947 at Westminster Abbey. As with most royal weddings, there were several wedding cakes. 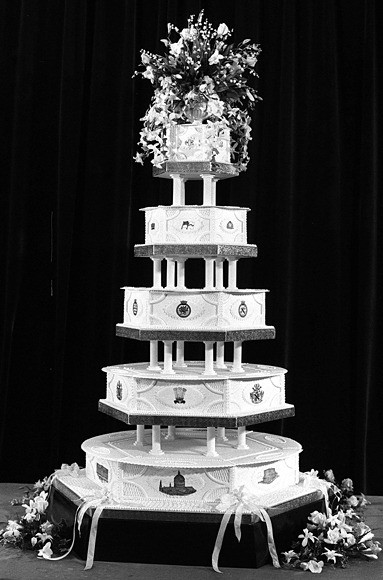 The main cake was a four tier cake was nine feet high and weighed 500 pounds, it is shown in the photo below. 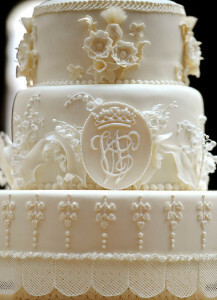 The cake was elaborately decorated with Tudor roses, charming cupid figures, lavish columns and royal insignias. At the wedding breakfast the wedding cake was cut the Duke of Edinburgh’s military sword. Prince Charles and Lady Diana were married on July 29, 1981 at St. Paul’s Cathedral. For the wedding breakfast held at Buckingham Palace there were an amazing 27 wedding cakes. The main cake was five tiered and stood five feet high was styled simply with only a few embellishments and took fourteen weeks to create. 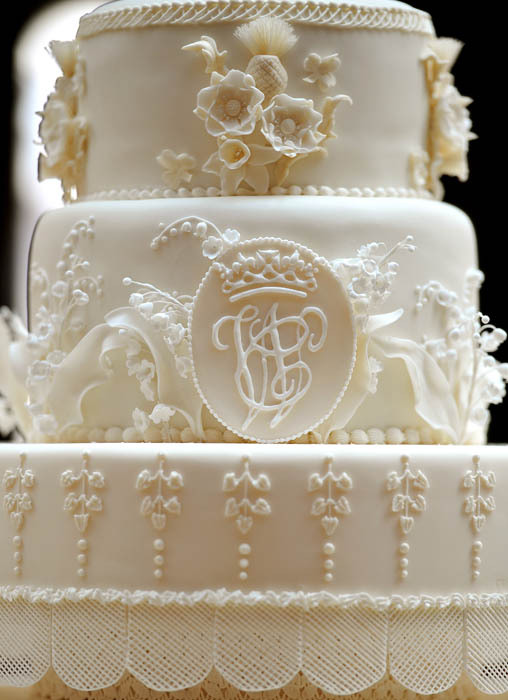 The cake was decorated with white royal icing and featured the Windsor coat of arms made in marzipan; also the couple’s initials were used to adorn the cake. The cake was topped with fresh flowers including roses, lilies of the valley and orchids. Prince William and Catherine Middleton, now known as the Duke and Duchess of Cambridge, were married on April 29, 2011 at Westminster Abbey. In following the royal tradition, a wedding breakfast was held after the ceremony at Buckingham Palace. Fiona Cairns decorated the traditional fruit cake was covered with white fondant and the customary piping and scrollwork; she also incorporated many historical and symbolic decorations. There were the traditional gum paste flowers including the rose for England, the thistle for Scotland, daffodils for Wales and shamrocks for Ireland. As a special touch the Sweet William flowers, symbolizing gallantry, were also used to honor the groom. Barry Colenso, a master chocolatier, worked with the McVitte Cake Company to create a special cake as requested by the groom. The actual recipe came from Buckingham Palace and it was based on a classic Tiffin cake which was Prince William’s favorite as a child. Extra decorations were added in the form of white chocolate flowers, each was was created by hand and took over 6 hours to make. Some historians trace the tradition of a wedding cake back to ancient Rome. The custom started with the simple act of breaking bread in half over the head of the bride to bring good luck to the married couple, this symbolized the “breaking of the bride’s virginal state and the subsequent dominance of the groom over her! In Medieval England at the wedding celebration cakes were stacked high and the bride and groom would try to kiss over the tower of pastries, if the couple could manage to kiss it was determined that they would have a happy and prosperous life together. Special Note: In some European countries today a croquemouche dessert is made from several stacked profiteroles (cream puff pastries), often decorated with spun sugar, which is frequently served at weddings, baptisms or first communions. 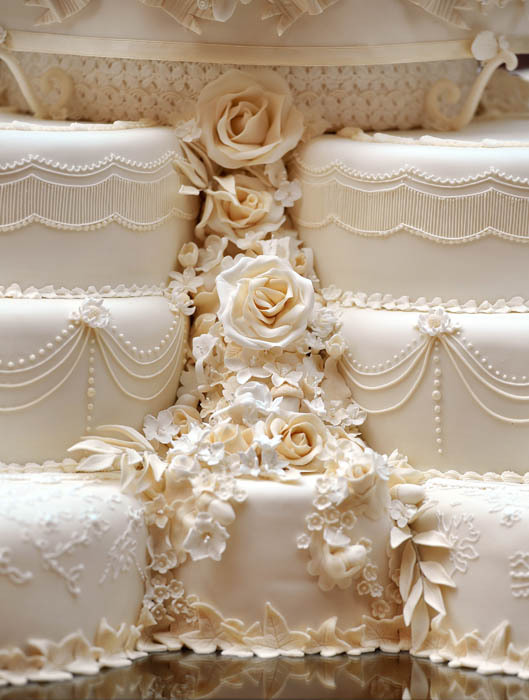 In the 17th century the custom was to have two cakes, one known as the bride’s cake and the other the groom’s cake. The bride’s cake traditionally was a pound cake with white icing to symbolize virginity and purity. The groom’s cake was usually a smaller, dark and rich fruit cake which symbolized fertility. By, the 19th century the custom of two cakes died out and a larger multi-tiered elaborately decorated cake took center stage at the wedding celebration, in the southern states of the United States the groom’s cake is still a tradition. 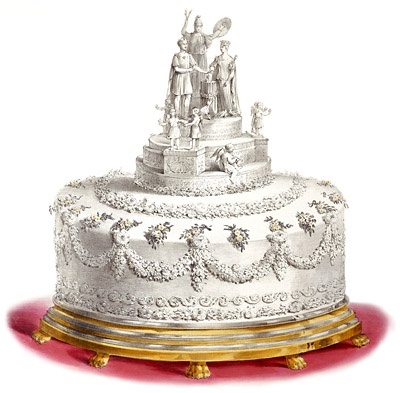 By the 19th century, the wedding cake for a royal or an aristocratic celebration was a lighter cake made with refined white sugar. Sugar was very expensive to be used in general baking and by making the wedding cake in this way a family could show their wealth and social status. 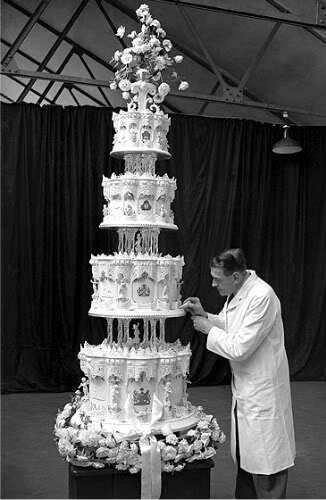 In Victorian times, wedding cakes were generally single-layered. 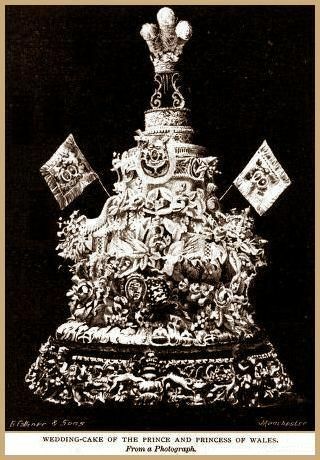 Then a three tiered cake debuted at the Great Exhibition of Crystal Palace Exhibition in London, the first tier was made of cake while the other two tiers were made entirely of sugar. This multi-tiered cake became popular for wedding cakes, dowels were used to separate the layers and the decorations became even more elaborate. One of the most popular traditions at a wedding celebration is the cutting of the cake. Originally the cake would be cut and the bride would distribute the slices to the guests. As wedding receptions grew in size through the years, the bride and groom would cut the cake, sharing the first slice between each other symbolizing their union and the ability to provide for each other in their future life together. Two other charming traditions are associated with wedding cake. The first is the cake pull custom which dates back to the Victorian era. Silver charms attached to silk ribbons were placed inside the cake. During the wedding reception the bridesmaids would pull the ribbons/charms from the cake, each charm would have a different meaning. Today, the cake pull is still a popular tradition in the southern states. The second (dare I say sweet!) tradition involves a slice of the wedding cake. Superstitiously in the past many bridesmaids cut a small piece of wedding cake, pass it through a bride’s wedding ring for luck and then it would be wrapped and placed under their pillow in the hopes that they would “dream about their future husband”. Later this custom evolved into slices of wedding cake specially packaged individually for guests to take home after the wedding to eat later or maybe perhaps to be tucked under their pillows! Shown in the photo below is a slice from the wedding cake of Prince William and Catherine Middleton.